Join the Virginia Equality Bar Association, Lambda Legal, and our hosting sponsor McGuireWoods, LLP for a special presentation and CLE* luncheon with Lambda Legal Counsel and Employment Fairness Project Director, Gregory R. Nevins. 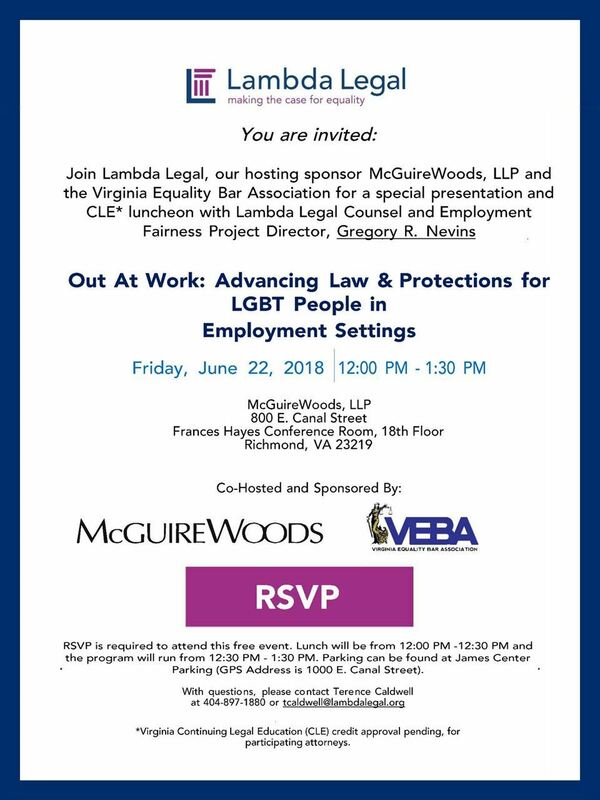 "Out At Work: Advancing Law & Protections for LGBT People in Employment Settings" will take place on Friday, June 22, 2018 from 12:00 PM - 1:30 PM at the Richmond office of McGuireWoods, LLP located at 800 E. Canal Street. Lunch will be from 12:00 PM -12:30 PM and the program will run from 12:30 PM - 1:30 PM. An RSVP is required to attend this free event. Lunch is provided courtesy of McGuireWoods. Parking can be found at James Center Parking (GPS Address is 1000 E. Canal Street). The CLE and lunch will take place in the Frances Hayes Conference Room on the 18th Floor. *Application for one (1) hour of Virginia MCLE credit approval is pending.